Lights and their strategic positioning have the competence of completely transforming the exterior look of your house. 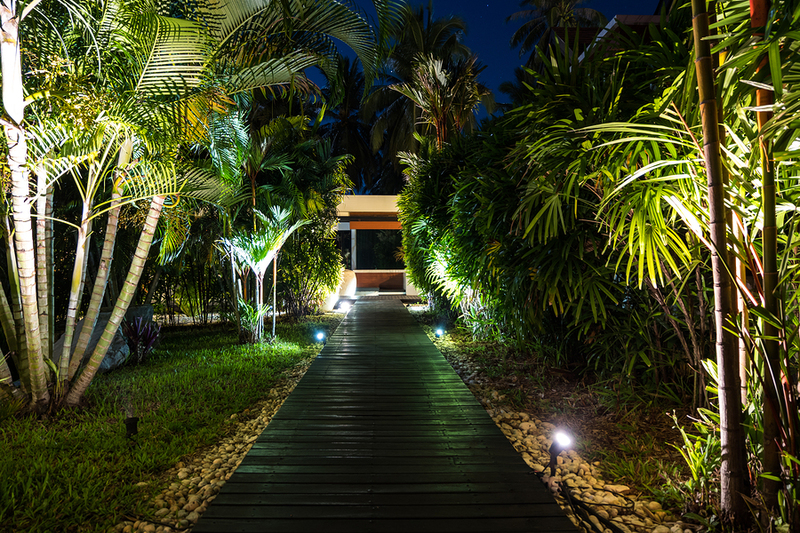 Landscape lights can be both functional and installed to enhance and adorn the decoration of your house. On the one hand, they light up your entire property, thereby keeping you safe from the prowling of trespassers and delinquents, and, on the other hand, they can be the perfect accessory to brighten up the appearance of the house. Despite the countless options of landscape lights in the market today, you must make sure that you settle down on an option that is congruent to your liking and the overall décor of your house. The choice of landscape lighting is also determined by the manner in which you want to capitalize on the available space in your grounds. Depending on this, you would have to conclude whether you would be in need of illumination along the pathways or driveways, or if you would prefer using landscape lights to highlight a centrepiece in your patio section. If you have a separate area for sports, you might have to choose a different set of lighting fixtures meant exclusively for this purpose. Enumerated below are a few essential tips that would be of help in guiding you through the process of choosing a particular variety of landscape lighting fixture. 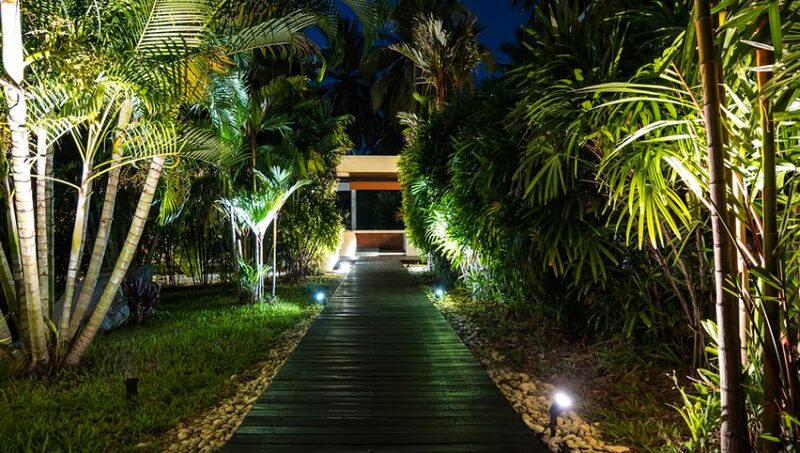 Night lighting in tropical garden Decorative LED lighting in garden to see the garden pathway at night with palm trees. Before you proceed with the purchase of landscape lights, make sure that you draw out a plan of what you would like to realize at the end of your project. The landscape lighting on your property is directly dependant on the efficaciousness of the layout that you make after careful inspection of the premises. While charting a blueprint, be certain to be inclusive of how the exterior lighting looks from inside the house too. This would help you to ensure that the design is synchronized with the all-round look of the house. Additionally, mark a few focal points on the layout that would be the locus of your exterior landscape. These areas would require special attention while settling down on the lights and it would be wise to choose lights that would highlight them and not overshadow them. Determining the focal point would also aid you in playing around with shadow effects to create more depth and dimension on the premises. Further, be conscious of the difference between ambient and spotlighting. The former is more mellow in tones and brightness and casts a veil of light over an extended area, while the latter refers to the use of strong lighting fixtures to focus attention on one particular part of the landscape. The three most popular choices of lighting strategies would comprise downlighting, uplighting, and cross lighting. Downlighting is the manipulation of lights in a manner that dissipates the light by pointing it downward. It aims at a softer, more affable glow dispersed over an area. Uplighting would be characteristic of dramatic and bolder lighting that creates strong accents highlighting the best features of the landscape and exploring the shadow effect on greater depth. The lights are pointed upwards, illuminating only a desired part of the property. Crosslighting is the strategy of cancelling out shadows by using both the upward and downward focal lighting. While choosing the light fixtures for your house, make sure that you are selecting more fixtures with comparatively lower lumen outputs. If you use a lesser number of fixtures, but higher light intensity, it ends up defeating the purpose of landscape lighting. This would create extremely illuminated centres in some areas and leave the great in the dark. This looks unsightly and is not conducive to the safety of your house as well. If you have decided to install landscape lighting in your house, you could consider soliciting the services of Pro Green Irrigation Services to help you navigate through this plan to realize the lighting of your liking.